Maureen Milliken is the author of the Bernie O’Dea mystery series, COLD HARD NEWS, which was released by S&H Publishing in June 2015, and NO NEWS IS BAD NEWS, which was released June 2016. The third in the series, with the working title BAD NEWS TRAVELS FAST, is due out late spring/early summer 2017. 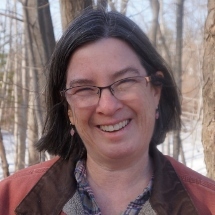 She draws heavily on her love of journalism and love for her home state in her character-driven novels, which take place in northern Franklin County, Maine. She also hosts a podcast, Crime&Stuff with her sister, artist Rebecca Milliken and blogs as part of the Maine Crime Writers group at mainecrimewriters.com. Maureen lives in central Maine. For more information about her books and appearances, go to maureenmilliken.com, follow her on Facebook at Maureen Milliken mysteries and on twitter at @mmilliken47. Information about the Crime&Stuff podcast can be found at crimeandstuffonline.com. Learn more about Maureen Milliken.